I personally think that Starbucks should have red cups year round... I don't know why I just like the red cups better. This sweater from Sheinside is by far my favorite. It is just so comfy and cozy. I wear it all of the time even when I am just at home doing nothing because it is so comfortable. It goes with pretty much anything. I love wearing white in the winter, well in South Florida its not really "wintery" all that much. But I definitely don't follow the no white after labor day rule! Lately my outfits have all been about being comfortable and still feeling put together. That is a great sweater! I have been eyeing it for a while now, prioritizing my purchases this month. Love this look! The perfect winter outfit! I wish they would keep red cups year around too!! Loving the pops of red!!! You look gorgeous and I love that sweater!! I love this whole look! I really want a pair of Hunter boots. Ahhh I'm sad the red cups are going away! 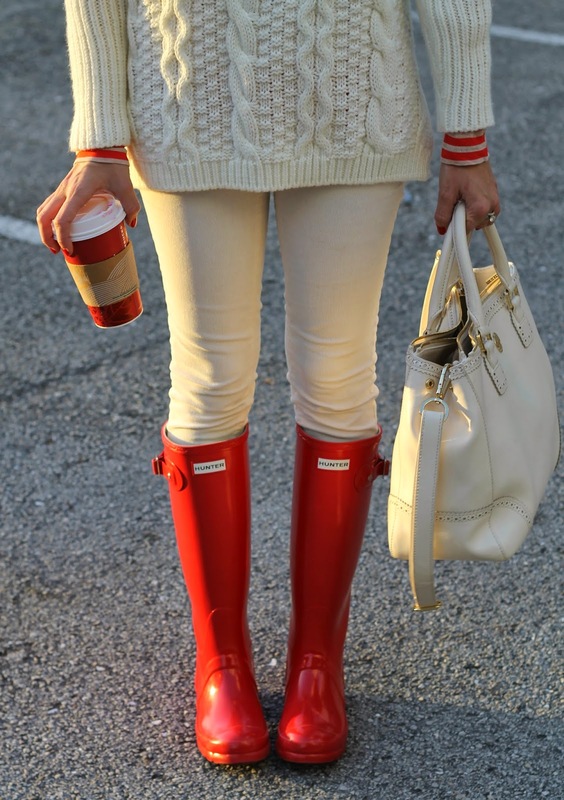 Love the red hunters with white jeans... I will definitely be copying that! AwwJade you look really yummy wearing your shiny Rubber Wellingtons. love that sweater! what are your thoughts about sheinside? is it hit or miss? Red and white are perfect together! Love your boots! Oh I totally agree.. this sweater is adorable on you!! Love all the pops of red too! Yes too sad the red cups are my Fav!! I actually think they should do Pink for October!! Love the look today..so cozy! And p.s. yes...I totally sized down a Full size on my Hunters! love red and white together! i wish starbucks would keep the red cups as well. or at least change them up with the seasons!